For other uses, see Family tree (disambiguation). Example of a family tree. Reading left to right Lucas Grey is the father of three children, the grandfather of five grandchildren and the great-grandfather of three siblings Joseph, John and Laura Wetter. Family tree showing the relationship of each person to the orange person, including cousins and gene share. 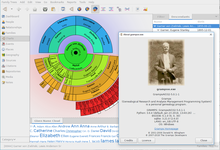 Screenshot of Gramps (v. 5.0.1) displaying a fan chart and the Given name cloud gramplet on the bottom. A "fan chart" features a half circle chart with concentric rings: the person of interest is the inner circle, the second circle is divided in two (each side is one parent), the third circle is divided in four, and so forth. Fan charts depict paternal and maternal ancestors. While family trees are depicted as trees, family relations do not in general form a tree in the sense of graph theory, since distant relatives can mate, so a person can have a common ancestor on their mother's and father's side. However, because a parent must be born before their child is born, a person cannot be their own ancestor, and thus there are no loops, so ancestry forms a directed acyclic graph. The graphs of matrilineal descent ("mother" relationships between women) and patrilineal descent ("father" relationships between men) are trees however. 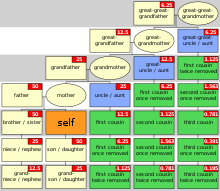 Assuming no common ancestor, an ancestry chart is a perfect binary tree, as each person has exactly one mother and one father, for two parents; these thus have a regular structure. 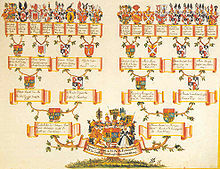 A descendancy chart, on the other hand, does not in general have a regular structure, as a person can have any number of children, or none at all. The longest family tree in the world is that of the Chinese philosopher and educator Confucius (551–479 BC), and he is the descendant of King Tang (1675–1646 BC). The tree spans more than 80 generations from him, and includes more than 2 million members. An international effort involving more than 450 branches around the world was started in 1998 to retrace and revise this family tree. A new edition of the Confucius genealogy was printed in September 2009 by the Confucius Genealogy Compilation Committee, to coincide with the 2560th anniversary of the birth of the Chinese thinker. This latest edition is expected to include some 1.3 million living members who are scattered around the world today. There are extensive genealogies for the ruling dynasties of China, but these do not form a single, unified family tree; and it is unclear at which point(s) the most ancient historical figures named become mythological. In Japan, the ancestry of the Imperial Family is traced back to the mythological origins of Japan. The connection to persons from the established historical record begins in the mid-first millennium AD. Another very old and extensive tree is that of the Lurie lineage—which includes Sigmund Freud and Martin Buber—and traces back to Jehiel Lurie, a 13th-century rabbi in Brest-Litovsk, and from there to Rashi and purportedly back to the legendary King David, as documented by Neil Rosenstein in his book The Lurie Legacy. The 1999 edition of the Guinness Book of Records recorded the Lurie family in the "longest lineage" category as oldest-known living family in the world today. The Biblical genealogies of Jesus also claim descent from the House of David; covering a period of approximately 1000 years. In the Torah and Old Testament, genealogies are provided for many biblical persons, including a record of the descendants of Adam. According to the Torah, the Kohanim are descended from Aaron. Genetic testing performed at the Technion has shown that most modern Kohanim share common Y-chromosome origins, although there is no complete family tree of the Kohanim. In the Islamic world, claimed descent from the prophet Mohammed greatly enhanced the status of political and religious leaders. New dynasties often used claims of such descent to help establish their legitimacy. In Europe, the pedigree of Niall Noígíallach would be a contender for the longest, through Conn of the Hundred Battles (fl. 123 AD); in the legendary history of Ireland he is further descended from Breogán, and ultimately from Adam, through the sons of Noah. Many noble and aristocratic families of European and West-Asian origin can reliably trace their ancestry back as far as the mid to late first millennium AD; some claiming undocumented descent from Classical Antiquity or mythological ancestors. Before the Dark Ages, in the Greco-Roman world, some reliable pedigrees dated back perhaps at least as far as the first half of the first millennium BC; with claimed or mythological origins reaching back further. Roman clan and family lineages played an important part in the structure of their society, and were the basis of their intricate system of personal names. However, there was a break in the continuity of records-keeping at the end of Classical Antiquity. Records of the lines of succession of the Popes and the Eastern Roman Emperors through this transitional period have survived, but these are not continuous genealogical histories of single families. See: descent from antiquity. In Africa, the ruling dynasty of Ethiopia claimed descent from King Solomon via the Queen of Sheba. The genealogy of Ancient Egyptian ruling dynasties was recorded from the beginnings of the Pharaonic era circa 3000 BC, to the end of the Ptolomaic Kingdom; although this is not a record of one continuously-linked family lineage, and surviving records are incomplete. In some pre-contact Native American civilizations, genealogical records of ruling and priestly families were kept, some of which extended over at least several centuries. In many human cultures clan and tribal associations are based on claims of common ancestry; although detailed documentation of those origins is often very limited. The author Pete Frame is notable for having produced "family trees" of rock bands. In this instance, the entries represent membership of certain groups, and personnel changes within them, rather than family relationships. Several books have been produced with his family trees, which in turn have led to a BBC television series about them, including interviews from the bands depicted in the trees. ^ Neil Rosenstein, Ranan R. Lurie. The Lurie Legacy: The House of Davidic Royal Descent. ISBN 978-1-886223-17-2. ^ Bill Gladstone (October 24, 2004). "The oldest family in the world". JTA. ^ "Amazon - Even More Rock Family trees". Retrieved 20 September 2012. ^ "BBC Four : Rock Family Trees". Retrieved 20 September 2012. Free utility to generate interactive family trees using Scalable Vector Graphics (SVG) for blog-posts and other Web pages – SVG Family-Tree Generator (v5.0).